WASHINGTON (AP) — A key Democratic senator is urging President Donald Trump not to pick a Supreme Court nominee who’s openly interested in overturning Roe v. Wade. West Virginia Senator Joe Manchin said Friday it would be tougher to confirm someone who would revamp the landmark decision. 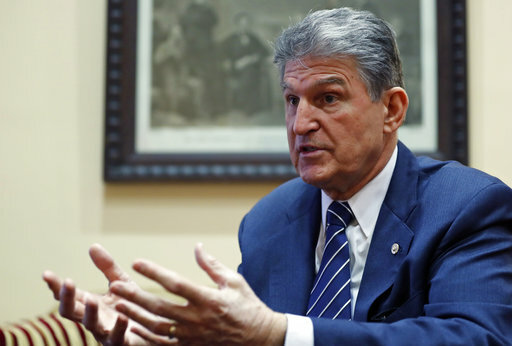 “I’m pro-life, but I know how that divides our country immediately, divides everyone,” Manchin said during an interview on a West Virginia radio station. “All that stuff is red flags for all Americans,” Manchin said, adding he told the president he told the president the same about repealing the Affordable Care Act. The senator was among several key Democrats and Republicans meeting with Trump late Thursday at the White House as the administration prepares to move quickly to replace retiring Justice Anthony Kennedy by fall. The Supreme Court opening poses a tough test for Democratic senators up for re-election this year in the states that Trump won in 2016, particularly Manchin, Sen. Heidi Heitkamp of North Dakota and Sen. Joe Donnelly of Indiana. But it also creates a career-defining dilemma for two key Republican women, Sen. Susan Collins of Maine and Sen. Lisa Murkowski of Alaska, who support access to abortion services. Trump swiftly invited all five to the White House to meet Thursday evening, the day after Kennedy’s stunning announcement. What’s becoming clear, though, is that to win over some of the senators, the administration will need to steer away from a nominee with widely and publicly shared personal views on abortion or overturning Roe vs. Wade. The Senate is bracing for a brutal confirmation process over one of the most divisive issues in the nation at a time when tensions are running high, but civil discourse is frayed, ahead of the November elections that could determine control of Congress. At the White House, the senators took turns meeting with Trump. Donnelly went in first to meet with the president and reported afterward they had a productive conversation. The Republican women, Collins and Murkowski filed in next together. Manchin was third. Then Heitkamp of North Dakota. Heitkamp said the president should think about a nominee who could unite, rather than divide, the country. “I told the president that he has a chance to unite the country by nominating a true non-ideological jurist who could gain strong support from senators on both sides of the aisle, rather than create more divisions,” she said in a statement. The three Democrats have broken with their party when it comes to some of Trump’s most important nominations. They were the only Democrats to have voted for Trump’s first Supreme Court selection, Neil Gorsuch. But opposing Trump’s next Supreme Court nomination could dissolve some of the goodwill they’ve built up with Trump supporters — who just so happen to represent most voters in their state. Trump won West Virginia by 42 percentage points in the 2016 election, North Dakota by 36 percentage points and Indiana by more than 19 percentage points. At the same time, supporting Trump’s nominee could bring its own political peril for Democrats — and the two Republicans — whose votes could be seen as the ones that could tip the 4-4 split on the court after Kennedy’s departure toward conservatives for a generation to come. “For voters in deep-red states who support Trump, this will be the litmus-test vote for whether you have President Trump’s back or not,” said Steven Law, president of the Senate Leadership Fund, a campaign group aligned with Senate Majority Leader Mitch McConnell. An affiliated group began running ads Thursday in 10 states that Trump won in 2016 where Democratic senators are now up for re-election. The Senate is bracing for Trump to announce a quick nominee as soon as July 10. Trump already has a list of potential court nominees and McConnell has signaled he wants to have a justice confirmed by October, which would be before the midterm election — even though Democrats are pushing to delay it until after voters have cast ballots in November. Democratic consultant and pollster Paul Maslin disputed the notion that the vote puts the incumbents in a tough spot. With Trump’s approval ratings at 41 percent he’s said it’s no surprise the president is trying to highlight the Supreme Court vote to push voters to the polls. “They’re looking for anything and everything to motivate their base because they know they’ve got a big problem on their hands,” said Maslin. Maslin said the court opening might even end up helping the Democratic incumbents if voters become worried that a tilt to the right will endanger abortion rights, gay rights and access to health care.